Luhuo, China -- Pointing to a thangka - a kind of Tibetan scroll-banner painting - hanging in an exhibition hall, Geleg Dainzin explained to a group of visitors how rewarding it is to paint all the tiny, intricate details on a Buddha. The Tibetan painter uses an interpreter to convey his message because he can only speak a few simple words in Mandarin. But for Dainzin and other thangka painters in the Tibetan county of Luhuo in southwest China''s Sichuan Province, the language obstacle at the local thangka exhibition is only a minor frustration compared with the enormous task of revitalizing their unique type of art. Thangkas are a form of Tibetan painting art that date back more than 1,000 years. Intended to serve as a guide for religious contemplation, they mainly depict images from Tibetan Buddhism. Thangka art reached its apogee in the works of the 17th century thangka master Namka Gyai. Known as the birthplace of Namka Gyai and "the home of thangka art", Luhuo is fighting to save its honor and its history, as thangka art tries to adjust to the modern world and most local artists struggle to make a living. Nestled among mountains at an altitude of more than 3,000 meters, Luhuo saw its thangka art boom in the 17th century, when Namka Gyai taught his skills to pupils there after gaining fame as one of the best thangka painters of the time. Combining Tibetan painting with Han nationality painting and western art, the works of Namka Gyai have puzzled and amazed experts, as the painter understood no foreign languages and was unlikely to have had access to knowledge about western art, said Yongda Lhamo, vice county head of Luhuo in charge of culture and publicity. "Thangka art reached a high level of sophistication in ancient times, but painters rarely received much payment, because most of their works went to temples and artists wouldn''t complain because of their religious piety," said Geleg Dainzin. "Sometimes the painter was only paid three meals a day," he said. Graced by delicate renderings of religious images, recounting legendary stories and featuring the use of precious mineral paint such as gold, silver and carnelian, thangka demands painstaking and time-consuming efforts in procedures like outlining and coloring. "It took me nearly 20 years of study, from the age of 5, to completely master the basic knowledge and skills," said 31-year-old Geleg Dainzin, who is a sixth-generation pupil of Namka Gyai. "A good thangka may take me a whole year to finish." There were once more than 100 thangka painters in Luhuo, but now only 20 remain, said Yongda Lhamo. "Others have gone to cities like Beijing and Shanghai, where they are hired by private businesses to make commercial thangkas for a booming market," said Liu Lifu, a Luhuo government publicity official. Most of the painters in Luhuo live in tough conditions, as their only customers are local residents and temples in Luhuo, which have a small population of 40,000, said Liu. 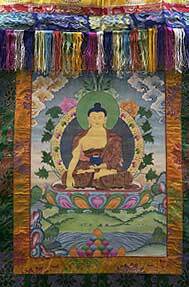 Many of those who have left are making cheap, low-quality thangkas, using synthetic paints instead of natural minerals. Back in Luhuo, the overall quality of thangkas produced by local painters has dropped because they simply do not earn enough money, said Liu. The low cost of digital reproduction of thangkas has also eroded the market for hand-painted ones and threatens the survival of the ancient skills, said Liu. A distant descendant of Namka Gyai, Geleg Dainzin is one of the few lucky thangka painters in Luhuo. He refused to reveal the price of his works, but said he is usually paid 150 yuan per workday and that the income can support his seven-member family. However, most individual painters are unlikely to get enough work to support themselves, let alone money to carry out research, said Liu. "If we can develop a market, there''ll be no need to worry about earnings," said Yongda Lhamo. The local government set up a thangka association this May in the hope of creating a market and turning the art form into a small cottage industry. "We did market research, which shows demand mainly comes from believers in Tibetan Buddhism and collectors," said Yongda Lhamo. "Now we can look for customers and negotiate on behalf of the painters, most of whom cannot speak Mandarin." The overseas market is a future focus for the association, and the county hopes to combine the appeal of thangka with the development of tourism, said Liu, citing the warm welcome thangka works received at an exhibition on Chinese intangible cultural heritage held in Paris, France this April. Another purpose of the association is to organize local artists and pave the way for better transmission of the art form, said Yongda Lhamo.Thangka masters have been invited to give lessons at local primary and middle schools and are encouraged to take as many pupils as possible, she said. Geleg Dainzin told the reporter that he has taken on three pupils, who are three, four and five years old respectively. "Learning thangka art is an arduous job. You have to start early by learning the Tibetan language," said Geleg Dainzin, "I would like my own son to become a thangka painter." China listed thangka art as a national intangible cultural heritage last year so that the art form can be better protected, but for thangka artists and the government in the remote county of Luhuo, more needs to be done. "We are experimenting with combining the traditional art form with modern content featuring the real lives of Tibetans, like a thangka depicting a lama playing basketball," he said, calling such works "the new thangkas." Last October, a collection of such "new thangkas" from Luhuo were exhibited in Beijing and found more favor with collectors than traditional works, with many of them being auctioned off for 5,000-10,000 yuan, according to Liu. "The only way to expand our market is to make more people, not only religious believers, understand and appreciate thangkas," he said. "That''s how the art form can gain a new lease of life."